Acne prone skin can be difficult to control and acne blemishes take time to clear up. It can be hard to find and all-in-one hydrating treatment that helps prevent new acne and corrects and conceals imperfections for a flawless finish instantly and over time. 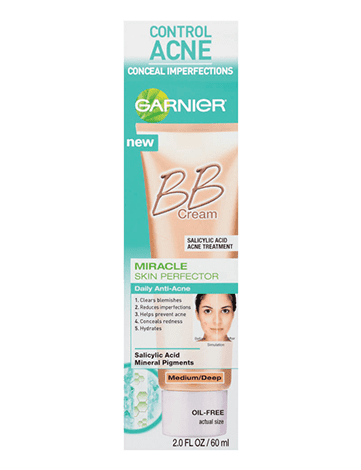 Garnier introduces Miracle Skin Perfector Daily Anti-Acne BB Cream; an effective light-weight formula that combines advanced skincare + immediate skin perfecting coverage. It helps prevent new breakouts and clears up acne blemishes. This multi-tasking acne treatment immediately conceals imperfections and redness while diminishing the appearance of pores for a clarified, even-toned look. Miracle Skin Perfector Daily Anti-Acne BB Cream is an all-in-one product designed to treat and help prevent new acne blemishes and conceal imperfections for a fresh faced, clarified complexion. This fast-absorbing, oil-free formula contains 2% Salicylic Acid to treat acne blemishes and Mineral Pigments to conceal imperfections. One product, five results: Clears acne blemishes, diminishes imperfections, helps prevent acne, minimized the appearance of redness and provides oil-free hydration. B.B. Cream (Beauty Balm Cream) is a daily hybrid formula that offers advanced skincare + immediate skin perfecting coverage. It combines several beauty routine steps in one single product. *For external use only. Flammable until dry. Do not use near fire, flame or heat. When using this product skin irritation and dryness is more likely to occur if you use another topical acne medication at the same time. If irritation occurs, only use one topical acne medication at a time. Keep out of reach of children. If swallowed, get medical help or contact a Poison Control Center right away. Complete your routine with Garnier Clean+ Refreshing Remover Towelettes and Blackhead Eliminating Scrub. Rated 5 out of 5 by Apey07 from Please bring back!!!! I know there are many women who love and depend on this product. Please be a company who actually cares about its customers and bring this product back. It’s the best I’ve ever used and I am incredibly disappointed to see it’s been discontinued. Rated 5 out of 5 by Breee from PLEASE BRING IT BACK Best garnier product I have ever purchased I had to stock up the last time and I just found out it was officially discontinued. :( I loved wearing this BB instead of foundation for my every day makeup routine because it was so light but still gave great natural coverage when set with a powder it really helped prevent me from breaking out. It was one of my favorite products of all time. Rated 5 out of 5 by Suesue54321 from Please bring product back. Bring it back the BEST product you guys have for acne issues. Rated 5 out of 5 by Yahweh from Excellent product This really helped me keep my face clear of acne. I tried all the other B.B. creams by this brand and they don’t work the same. Please bring it back. Rated 5 out of 5 by Alyak from Discontinued :( I bought this one time and was instantly hooked! Now that I need it, it's discontinued. loveeeee this. Bring it back! Rated 4 out of 5 by Shiyee from An Awesome Product! I recently had breakouts.. hormone changed and causes acne around my cheeks and chin area. Was looking for a product that have good coverage and yet do not clog pores. I have tried the Garnier Anti-Acne BB Cream and my skin condition got so much better. It treated my skin & prevent outbreaks. I am really pleased with the product and hope to see more products of the anti-acne range. You save my life!!! A big THANK YOU!